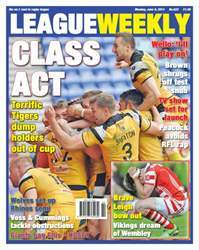 Classy Cas have stunned the champion Wigan Warriors and are 80 minutes away from Wembley. We have all the best reports, reaction and analysis from a fantastic week in the world of rugby league, with top commentary from Aussie caller Andrew Voss, former refs' boss Stuart Cummings, plus publisher Danny Lockwood on Steve McNamara's latest PR-speak. Dave 'Nosey' Parker has the big news on the transfer front ... and as usual, lots, lots more!